What is bread? Bread is basically flour and water mixed together and then either baked, roasted or fried. Different parts of the world use different flours and different ingredients are added to make it soft, with crumbs, with flavor and to give it a required texture. Most part of the world considers some form of bread as their staple diet except for East Asia where the stable is rice and some African countries where the staple is cornmeal cooked into a porridge like consistency. We have the more famous brioche, baguettes, rye breads,naans, parathas to less heard of breads like dorayaki, kaya,lahoh. The list of different breads all over the world is endless. 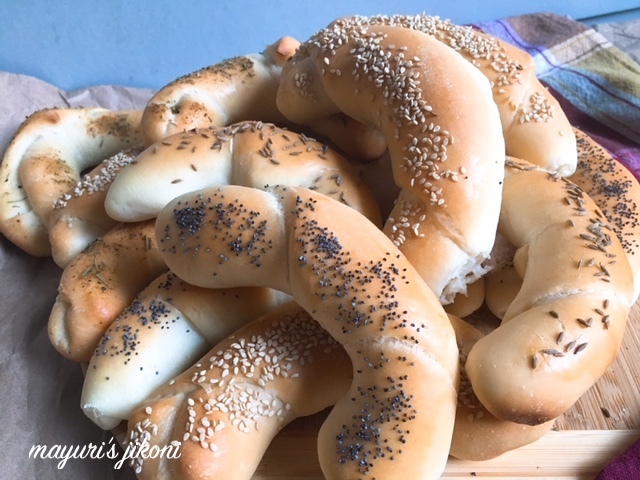 For the month of September, our host Wendy who blogs at A Day in the Life on the Farm suggested we make International Breads, preferably from another country and not your own. Wendy thanks for the exciting theme. It was really difficult to choose from which country to bake a bread. We are spoilt for choice. There are so many different types of breads, flatbreads out there in the world. I chose to make rozky or rather rozak from Slovakia. Rozky (plural rozak) are very famous in Slovakia. These mini baguette like rolls are enjoyed during every meal. Easy to make, soft and delicious. What attracted me to bake these rolls for the theme International Breads was the shape. The left over rolls stayed pretty fresh for 2 days. The first day we enjoyed the rolls with some home made soup and the next day we had them for breakfast with some butter and marmalade. Mix flour, salt, sugar and yeast in a big bowl. Ad melted butter and rub it into the flour. Add the milk and form a dough. Dust the worktop with some flour. Knead the dough on the worktop for 10-15 minutes till you get a nice soft smooth silky dough. Grease the bowl and the dough. Place the dough in the bowl. Cover with a damp tea towel or cling film. Let the dough rise till its double in size. Mine took about 1½ hours. Dust the work top lightly with flour. Remove the risen dough from the bowl. Gently shape it into a ball. Cut it into 4 parts with a sharp knife. Roll one part into a 1/8 or ¼ inch circle. Cut into 4 parts (quarters). With the widest part of the triangle facing you, fold the 2 corners. Roll the dough up into a cylindrical shape. Put it on a greased and parchment paper lined tray. Give the cylindrical shape a slight crescent like shape. Repeat steps 15-18 with the remaining quarters. Repeat steps 13-19 with the remaining 3 parts of the dough. Let the shaped rolls rise for 45-60 minutes till double in size. Brush the rolls with milk or egg wash.
Sprinkle the rolls with the seeds and herbs. Bake the rolls in the oven for 15-20 minutes or till they are golden in colour. Remove the rolls from the oven. Let them cool on a wire rack. Serve these rolls with a salad, soup or simply enjoy them with a cup of tea or coffee. Use caraway seeds as topping. I find that with egg wash the seeds and herbs stuck well on the rolls. I love these little horns of goodness. I know that they taste as good as they look. It's amazing the different kinds of breads you can make with just flour, water, salt, and yeast! I love the shape and can't wait to try these! Perfect to have these rolls with a bowl if soup. They are so beautifully​shaped I love them. These little rolls are so cute, Mayuri. I would love them with a little marmalade. Wow, the rolls look fantastic mayuri……. Hello Mayuri, I can't take my eyes off your rolls! they look so beautiful stacked together. I loved the topping of different seeds lending different flavours. Your rolls look amazing Mayuri. Very unique and interesting shape. these look amazing ! easy to shape too 🙂 am going to try it during the school vacations ! The first thing my son said after looking at your bread was baloon shaped bread. The Sesame and poppy seeds look amazing on that golden cute bread.